Who could not be happy that Mark Webber at last defeated his rotten luck to win a GP? To have done it after a drive-through penalty that seemed to have ended his chances underlines how difficult things always seem to be for the gritty Australian; not for him the straightforward drive from pole to flag. Of course, it helped that the Red Bull RB5 was superior in the conditions and on this track, that the team were canny enough to minimize the effect of the penalty and that Massa and Kovalainen held back the competition, but Mark still had to be quick and consistent. He earned this one. Sebastian Vettel provided Red Bull with another one-two and was gracious in his comments on his team mate afterwards. 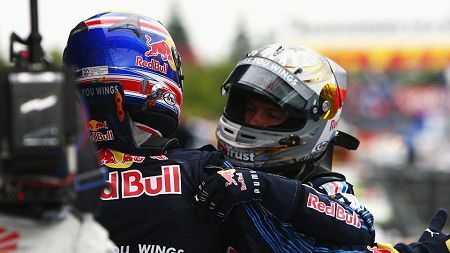 Mark was the quicker of the pair at this GP and der Seb was not afraid to admit it - one can see why he is so popular. And Red Bull emerge as serious contenders for both championships, although it will be difficult for the team to decide which of their drivers, if either, to back. Which must be good news for Brawn GP, who do not have quite such a problem with choosing a lead driver. Barrichello may protest about poor team strategy but he needs to beat his team mate in Webber-like style before anyone will take him seriously. Yes, Button has had the luck this season but Rubens has been slow when he needed to be quick and yes, the Brawn strategy was flawed in Germany but it was the same for both drivers. Jenson has taken his chances when presented, been one of the few to overtake road blocks when necessary and accepted those occasions when the car has not had the measure of the Red Bull. The Nurburgring was unkind indeed to Brawn, in fact, the cool temperatures working against the team and the resort to three-stop strategies an uncharacteristic mistake made probably in the knowledge that the car would struggle to compete in the race. In the event, it served only to hamper them, allowing Massa's Ferrari and Rosberg's Williams through by virtue of longer stints between fuel stops. A lot of commentators are presuming that the RB5 is now the better car, so superior has it been in the last two races, but I think this is a blip caused by unusually low race day temperatures. The Brawn BGP 001 has been consistently good on warmer days and I am sure the team's competitiveness will return as temperatures rise. But I also think that the Brawn team, in common with most others, missed a trick in the German GP. The track was a little warmer on race day than during practice and qualifying and, for cars that had trouble getting heat into the tires, this was just the opportunity to take the primes for two stints, rather than the option tire. So bad was the graining of the option for most drivers that it appeared obvious to me that the prime was the better choice. This was ably demonstrated in Button's last stint, when his softer tires gave him an initial burst of speed to take him clear of Barrichello - but the tires went off so quickly that, in very few laps, Rubens was right with him again. It seems to me that the best strategy would have been to start the race on option tires and then switch to the prime for all later stints - an opportunity missed maybe. Felipe Massa and Nico Rosberg earned their excellent finishes through perseverance on heavy fuel loads; if you can last long enough before the first stop, you rise gradually to the top. Being difficult to pass is all that is necessary thereafter. The enigma of the race was Fernando Alonso - how the Renault can be quick enough to set the fastest lap of the race and yet abysmally slow at other times is beyond me. Perhaps it is just another indication of the genius of Alonso in getting the best possible from the car he is given. And finally a word about Adrian Sutil, forever the bridesmaid and never the bride. This really should have been the occasion of his and the team's first points; he had done the work and deservedly held his position until the collision with Raikkonen. Unlike most commentators, I do not see the incident as "a racing accident" - Sutil clearly had the inside line and it was up to the Finn to find the room outside if he wanted to contest the corner therefore. Instead, Kimi drove into the Force India as though it were not there. But what happens, happens and apparently the drivers have settled the thing amicably enough. Let us hope that this will not be the last opportunity for Adrian to shine and that the team can score before the end of the season. For once, the major interest in the race was at the front and Webber's strong drive to victory. Clearly, the season is not over yet and the Brawn team is going to have to fight for the championships that looked so guaranteed only a couple of races ago. I still think Jenson will do it, however. From Ross Brawn - in part only: "You just cannot win a race, whatever strategy you are on, when your fastest lap (1:34.676) is only the 11th fastest lap - it is just impossible and those are the real facts." Yes, I am to be counted among those who previously saw Button (6th fastest lap @ 1:34.252) as a mid-pack journeyman only, but competent machinery suggests he should be rated somewhat higher than that. To go from your leg and shoulder in bits to GP winner in months shows that Webber has the right stuff, if He,s engine had blown on the last lap I would swear there,s no justice in this World (and swear! ), I would of loved to of seen He's BPM through the first corner, a combination of yes yes yes no no no with no eye blinking ( been catching up on your previous blogs! ) shame about Hamilton being a little bit ambitious in to turn 1, reminded me of Schui in 2000 with Fisi, would of been even sweeter if Webber had still won :.) . So to Rubens, after playing second fiddle to Ferrari you can tell He's seen this sheet music before, and I for One cant blame Him for showing He's disconsent, whether its truth of paranoia History wil decide. One last point I'd like to mention is the ' Ferrari taking corners that are occoupied by cars leaving the Pits ' is it De ja vu or have I seen a Red Bull incurring this malfunction in logic. I had to miss the race so was surprised to see Massa's results (really pleased for Webber). Was it down to KERS working for them here or was it more down to fueling and pit strategy? Or do you think the car just worked better on this track and those temperatures? Since I've read Ferrari are about to scrap development on this car it's hard to believe there's been any real improvements acheived. I see a race developing for both championships by years end. Brawn can not afford to coast through the end of the season as they have a fight on their hands. We went through this in 2007, didn't we? I did see the contact between Kimi ans Sutil as a racing incident. Sometimes there is contact in racing, especially at 10/10ths. To temper that would be to redefine racing on the edge. If racing was easy, we all would be racers. What I find interesting is all this noise about Bourdais. What if this was Jenson who in a not so good car is also not so good? We all know a good driver takes a good car by its horns but that a great driver does the same with a bad car. What if Bourdais was given a Brawn would he be as good as Jenson and Barrichello? Poor fellow Bourdais never had a chance in that choleric team. According to David Hobbs, the rule says the car on track should give way to the car exiting the pits, HAH! He went on to say, however, if he was exiting the pits on cold tires he would give a wide berth to any traffic. Funny that both times Sutil has really been in with a chance, it's been Kimi who's done for him. The responsibility may have been Kimi's but if I'm Sutil going for my team's first points, I don't take a risk like this. I agree, Clive, when then track temps rise so will the Brawns. Firstly, WOO HOO !! Go Webber !! I am one very happy Aussie indeed, never enjoyed hearing the Australian anthem so much as I did on sunday. I found it extremely interesting Lewis Hamilton wanted to park his car and save the motor and transmission. That may seem logical with the longevity rules of the current cars, but it lacks the mentality you usually see in Championship drivers. For the most part, it may be easier for the car on the track to see the car entering the racetrack, but to think they will just yield and get behind a car entering from the pits with cold tires is not logical. Naturally, they will try to get by so they are not held up. I think Hamiltons opinion was derived from the fact that the car was so badly damaged that it was both undriveable and useless for gathering data. The only way he could have got into any points position was if it rained heavily and caught a lot of people out all at the same time. I think he was thinking like a champion by realising that to save the gearbox for another fight would be the best option for winning races. I do not think hamilton was over optimistic into the first corner. He got the puncture a split second before he needed to break to make the corner. The puncture meant that he could not break quick enough or control the car enough to prevent him from leaving the track. In fact I am amazed that he managed to keep the car out of the barriers! Well done to him though, he drove a great race and fully deserved to win. Finally! I never thought I'd see him do it, but Webber's done it! The last 20 laps were agony - I was just waiting for his engine to go pop (though I think Sutil might've inherited Mark's famous bad luck)! I rather optimistically posted here during pre-season testing that I thought Webber would win his first race this year, and I'm almost as delighted as the man himself that he crossed the line in P1. I didn't think I'd get to see an Australian win a GP (I was a bit too young to see Alan Jones do the business), so I'm a wee bit chuffed to see Webber win. Well done mate! Well not a good race from my perspective, but Webber was the class of the field so I can't argue with the results. I do disagree with your assesment of the Sutil/Raikonnen accident. I'm with the majority and think it's a racing accident. Webber on the other hand was justly penalized for his hit on Barrichello. If you take a penalty, taking it on a dominant day is the day to take it. Well the season is hotting up nicely. I hope Button doesn't win in Hungary as thsi will really make things interesting. Yes Lee, I understand why he thought about quitting the race and saving the pieces. This is a byproduct of the new rules of F1. David: I think it is always the best policy for a driver to keep any criticism of the team within the team. Barrichello has done himself no favours by his outburst, although it was understandable in many ways. As regards Button, I have always regarded him as very talented but had begun to wonder if the years of uncompetitive machinery had blunted his edge. It seems he is answering any such fears this season! Vera: All the KERS cars gained places at the start so I think it is fair to say it played a part in Massa being able to gain several spots by the first turn. He lost one of them to Button in the lap that followed but thereafter was able to hold his position; the Ferrari was not as quick as the Red Bulls or Brawns but was competitive with everything else, I think. It may be a little early to give up on the F60 but the team are obviously aware of how much their concentration on last year's car cost them when it came to this season. They don't want a repeat of that, after all. No doubt the thought is that they must produce a car capable of winning races in 2010, especially if the Alonso rumours are true! Aracer: I think the Raikkonen/Sutil collision was a racing incident in that it happens often in racing. But it is really up to the man outside to ensure that no contact is made, especially as it is usually the outer car that gets knocked off the circuit in such circumstances. We need to think back to Kimi and Hamilton at Spa a couple of years ago when all the anti-Hamilton fanatics were saying he should have braked to avoid going off the circuit when Raikkonen closed the door into the second part of the chicane. Well, if that was true for Lewis (ignoring that he had no time to brake and it was not an option therefore), it is just as true for Raikkonen in a similar situation. Sutil had the inside of the corner and his line forced him to drift towards the outside as the corner was completed. Kimi should have known that this would happen and chosen either to brake or use the run-off area. It was foolhardy to insist on sticking to his line since a collision then became inevitable. Michael: Agreed that STR is not the most forgiving of teams. But Bourdais has been given plenty of time to get things together and does not seem to making any improvement. I don't really approve of kicking drivers out of their seats halfway through a season but, if it has to be done, Sebastien is the obvious candidate. Keith: And the laws of physics dictated that, to complete the corner, Sutil needed the bit of road that Kimi was occupying. It was less a question of rights than a matter of discretion being the better part of valour. It could just as easily have been Kimi whose car suffered damage while Sutil drove away happily and Kimi should have either braked or taken to the run-off area. That's the way I see it, anyhow. Lee: Yes, Mark Webber is the same as all the other drivers - ready to criticise others for dangerous moves but guilty of them too in the heat of competition. I will say, however, that Mark's move on Barrichello was much worse than any of the moves made by Hamilton that have received so much criticism. I do accept his explanation that he thought Rubens was on the other side of him, which mitigates the offence somewhat. Timbo: During the off season, I tipped the Webber/Vettel pairing as the most interesting and competitive of all. I also warned that Webber was capable of beating Vettel and am glad that he has proved me right at last. It should be very interesting to see how the struggle between these two develops as the season progresses. Brawn may be consistently quick in warmer days, but Red Bull made a big step forward in Silverstone where 67 new parts were added to the RB5. Therefore, it won't be that wise to suggest that Brawn will be quicker than Red Boll on a much warmer track 'cause it will be neck-and-neck, if not RB5 is quicker than BGP001. Remember that Horner said after the race "I think that we have got a car that we should be able to fight them in all conditions. We are pushing them very hard on development. We still have performance to come to the car and it will be a really exciting second half of the season. Budapest is usually quite warm, so we will see there. But I don't think the temperature was anything to do with today. I think the performance of the car was very good, the drivers drove brilliantly and there are no high speed corners here, so that was not a factor this weekend. So, we will see." Clive: I think Bourdais was penalised during last year Japanese GP because he caused a collision with a driver who was fighting for the championship title. If that collision happened with anyone but Massa or Hamilton, he'd go unpenalised. Correct me if I'm wrong, but I remember Kubica being penalised for causing a colision with Hamilton during the same GP, in 2007. So, this would be a reason why neither Kimi nor Sutil gone unpenalised during that incident. So, who is caring if Sutil and Kimi crashes into each other? They are just fighting for points, after all. Of course we were sad, because we all want to see Force India's first points, but the stewards can't penalise anyone for every racing incident. No one was guilty in this one, in my opinion. There's a difference between Hamilton's moves of last year and this Kimi-Sutil clash in the last weekend though. I remember the Italian GP, when Hamilton made a move on Glock. I was so pissed, because he clearly forced Timo off the track, without recieving any penalty. A nice overtaking move is when you overtake the other guy on the track, not forcing the him out of it! That was indeed a dirty move, just like Webber did on Barrichello last sunday, which could have trigged a pile up in the start/finish straight. Well deserved penalty for him. Glock went off the track in that incident because he chose to fight the position rather than letting hamilton (who was in a better position to claim the racing line) clear him. Glock could have slowed and made the corner but instead went off the track. In my opinion if anyone was wrong in the kimi, sutil incident it was kimi as he clearly watched sutil come out of the pits and into the corner. Kimi could have slowed and avoided the incident but to be honest I don't really think either deserved a penalty for what was essentially a judgement mistake by both of them. You just cannot win a race, whatever strategy you are on, when your fastest lap (1:34.676) is only the 11th fastest lap - it is just impossible and those are the real facts." As for the Sutil/Raikkonen incident, I put the blame on Raikkonen. Sutil had already taken as tight a line as possible and slid out. Raikkonen could have braked, let Sutil go and tackled him later in the lap. I was very impressed by how calm both drivers were about it afterwards, though.